Our writers (i.e. Lecturers, Senior Lecturers and Professors from esteemed UK universities) work on the simplest payment terms devoid of any discrimination. So, we don’t have any complex price plan. Our rates appear to be higher than that of other similar websites. But, our clients get the maximum value for money as the quality of editing and writing provided by our writers (i.e. Lecturers, Senior Lecturers and Professors) is always the best. Here best quality means non-plagiarised piece of work drafted in perfect English language that helps our students score high in their assessments. Statistical work (including charts, graphs, tables etc.) 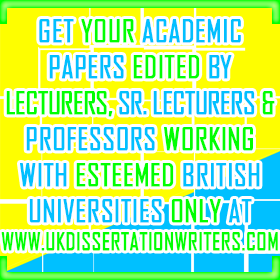 presented by our professional writers in any dissertation or assignment gives you an edge over your peers. Kindly check out our ‘About Us‘ section to find out more about the initiatives that our writers take in order to add quality to your academic papers. However, please note that the above-mentioned rates shall not be applicable to any technical/creative assignments like Mathematical/Statistical/Accounting calculations, Excel worksheets, Large-sized tables, Diagrams, PowerPoint Presentations, Designs, Maps, Engineering assignments, Business Plan and any work involving the use of special software. Such piece of work are charged at special rates as these require more efforts than normal academic writing and editing work. If any student needs help with any such technical assignment, we can provide a quotation on the basis of the exact requirements of such project. So, what are you waiting for? ‘Contact Us‘ with your needs now, and we will be more than happy to assist you with the same. Do you still have any question unanswered? You may want to scroll through our ‘Frequently Asked Questions‘ section to find your answers now.